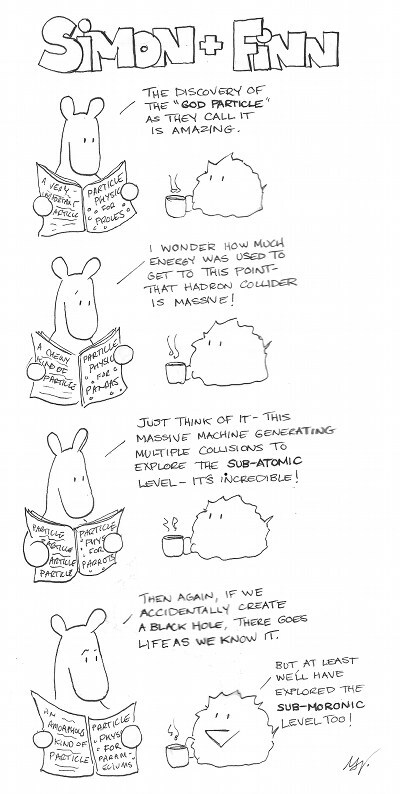 This cartoon originally accompanied an earlier post on the Higgs Boson particle and the Large Hadron Collider – The mostly harmless Higgs Boson (or so long, and thanks for all the fonts). This entry was posted in S&F Cartoons only, Sciency stuff and tagged comic sans higgs boson, douglas adams, god particle, god particle joke, hadron joke, higgs boson by simonandfinn. Bookmark the permalink.